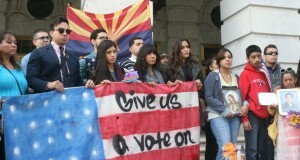 Arizona Republican legislators advanced several election-related bills Wednesday that Democrats say would limit voter participation and open the doors to heavier spending to influence elections by deep-pocketed donors. More than 100 business, labor, political and campaign figures met at the Biltmore yesterday afternoon for a DuVal campaign finance meeting that yielded more than $1 million in fundraising commitments, according to the campaign and other attendees. Nearly three years after lawmakers started soliciting public donations to build a portion of fence along Arizona’s border with Mexico, lawmakers still don’t have a plan to build a fence with the $264,028 they have received. Arizona Gov. Jan Brewer's political action committee reports receiving more than $900,000 in donations this year, including $250,000 from billionaire Las Vegas casino owner Sheldon Adelson and his wife, Miriam. For those whose role can involve fundraising and who would seem to have more than a passing interest in the outcome of the presidential campaign, few of Arizona’s state and federal elected leaders had made personal campaign contributions to Mitt Romney or Barack Obama through Sept. 30.